Why is my AutoCAD text missing in the bottom or right edge or shifted on the top or left edge? AutoCAD has had a bug that Autodesk refuses to fix since AutoCAD 2000. 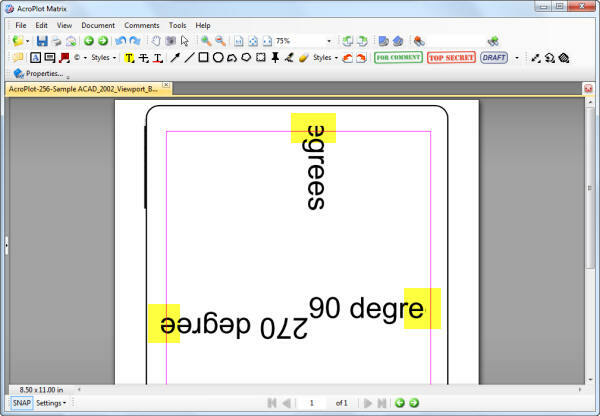 If you notice when you select the PDF-XChange for AcroPlot Pro system printer in AutoCAD it will show that the paper sizes have a 0.125" margin even though the margins in the PDF-XChange for AcroPlot Pro system printer is set to have a 0.0 margin. The reason for this is that somebody way back when felt that they should consider any margin less than 0.125" as invalid (probably because in the old days printers couldn't print all of the way to the edge). Autodesk has confirmed this as a bug years ago and assured us that it has nothing to do with our printer driver. Now normally this wouldn't be a big problem except Autodesk has another bug in the program (again which they refuse to fix) which relates to how True Type Text is sent out. When True Type Text is sent out to a printer as text it has two parts. The first part is the clipping plane that defines what the rectangle is that will clip the text if it is near the edge of a viewport or the edge of the paper. The second part is the actual text information itself. The problem is that Autodesk uses the real margin of the printer for the first part and the assumed (0.125") margin for the second part causing the text to be clipped wrong. You can see the problem areas highlighted below. So How do I Get Around the Bug? 1.) Use our AcroPlot Pro or AcroPlot Jr. interface. There are more features like per object transparency that is not supported when going directly to the driver. We will also be releasing versions of AcroPlot Pro that support searchable text for shx and True Type fonts that are not a 1.0 width factor that again cannot be accomplished when printing directly to a PDF driver. 2.) The best way around this is to use a pc3 and pmp file and define the margins in the pmp file to 0.0 for every size paper you print to. This is essentially what we do behind the scenes when you use our AcroPlot Pro or AcroPlot Jr. interface. 3.) Or you could create a Pc3/Pmp (AutoCAD Plotter Configuration) file in AutoCAD and then use the Custom Properties to get to the PDF-XChange for AcroPlot Pro printer driver. Then set the margin to 0.125" there and save the settings so only AutoCAD will use the larger margin value. 4.) Another option is to set the Margin in the PDF-XChange for AcroPlot Pro printer driver to 0.125" for all of your programs. 5.) Tha last option is to set the Pc3 file options to Create True Type Text As Graphics although this then creates larger size files typically and you won't have searchable text. We do recommend this option. Why do I not see this Bug with the Adobe PDF, AutoCAD PDF, or Other Drivers? The AutoCAD DWF and PDF drivers both bypass the Windows System Printing and hence they do not have this bug in their drivers. But trust us, they have plenty of other bugs with MText Masks, Wipeouts, and larger file sizes. This is why most of our users continue to use AcroPlot Pro to create the best PDF files from AutoCAD. The Adobe driver and many other PDF drivers are based off of a Postscript printing process instead of the Windows GDI printing that our PDF Driver uses as well as the vast majority of printer drivers. Postscript drivers from AutoCAD always convert text as graphics and they also don't support lines merge. So since the text is not sent out as text there is no clipping planes to send out and the bug doesn't show up. Since the vast majority of users create PDF files through our programs we were not about to go the postscript route and loose out on searchable text and lines merge for our users. Again don't believe us, try printing it to the Microsoft XPS Document Writer that is included in Windows and you will get similar results as seen below.